Comfrey is one of the best wound healing herbs. This can be internal also, although no longer recommended. I can remember when my grandmother, in her nineties, would always have a patch of comfrey growing in the garden, much to my father's dismay. She had a knack for knowing just what to eat in nature to "set her body right”. Every once in a while, she would cook up a batch of comfrey and eat it as we would kale or other greens. My father would call me in a panic, but I would assure him that in her mid nineties, she knew what her body needed. Externally, comfrey is excellent for torn ligaments, strains, sprains, bruises, and injuries to bones and joints. We still offer and use it to assist the healing of broken bones. A fellow practitioner and dear friend used it to assist in the healing of multiple bone fractures that were a result of very severe auto accident. We were amazed at how fast and how well she healed. According to a book I was reading, comfrey contains a constituent allantoin which stimulates cell proliferation and assists wound healing both inside and out. Although wonderful for wound healing comfrey is not intended to be used on deep wounds as the surface may heal before the deeper layers, leading to potentially serious infections. For this reason we have chosen to add other wound healing oils to our salve which we call, Comfrey & Calendula Salve. 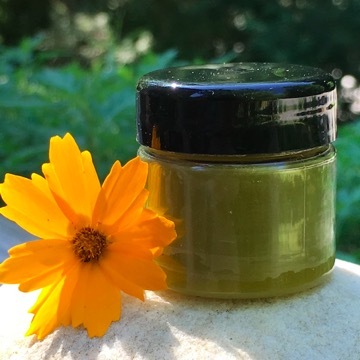 Calendula oil can be found in our salve and is also a wound healing herb that assists in the healing process by bringing circulation to the area of distress. Personally, I find calendula a very comforting herb that also has antispasmodic properties. It stimulates production of collagen at wound sites and minimizes scaring. Calendula also has antibacterial and immunostimulant properties. Tamanu oil is another amazing oil in our Comfrey & Calendula Salve. It is renowned for its skin healing properties. Tamanu oil is good for wound healing of severe cuts and burns, and is antibacterial, germicidal, anti-inflammatory, and promotes new tissue formation accelerating healing and healthy skin growth. It comes from the fruit of the tree which grows in Madagascar. Our salve also contains Marula oil. This oil is high in both antioxidant and antibacterial properties. The really cool thing about Marula oil is the fact that it comes from an edible kernel encased in a large hard seed found in the fruit of the Marula tree. The kernels are so rich in oil that the oil can be extracted simply by squeezing. The Comfrey & Calendula Salve is such a wonderful healing salve and is a must for your medicine chest.